The 28-year-old is set for a switch from Brighton & Hove Albion to his home city of Glasgow and the club he has been a lifelong fan of. 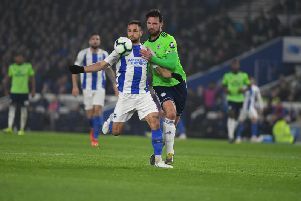 Murphy played a key role last season as the Seagulls were promoted to the Premier League but has made just one start and three substitute appearances in the league this term, the last, back in September. Our sister paper The Scotsman is one of many national media outlets reporting the move which is set to be confirmed later today. Murphy leaves Brighton with 76 appearances to his name having scored eight goals in his two and a half seasons with the club. The attacking player began his career at Motherwell where he spent seven years and then had a spell at Sheffield United, before signing for Albion in the summer of 2015.